We picked up the fiver after repairs in Chanute, Kansas and headed a few short miles to Elk City Lake. It is about 5 miles out of Independence Kansas. I wanted to stay long enough to go to the Zoo in Independence, but we did not get to manage it. Our concern was to check out the repairs and to be sure that everything was working well. In the past, we had something repaired and left town promptly only to discover that it was not completely fixed. Once one is 400 miles away, not much help comes from some repair facilities. Nu-Wa seemed to know what was needed and appeared to do a good job and I have the opinion that they would respond better than others have in the past for us if something didn’t still work properly. It appeared that they ran their repairs through various checks to be sure. However, we also needed a bit of a respite to line up our taxes for last year and to veg out a bit. We had been concerned about the rig. It is so nice to have it in tip-top shape again. 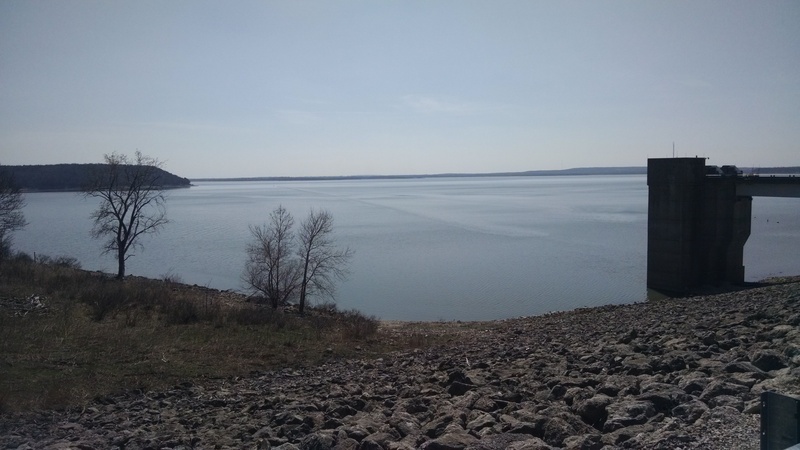 Elk City Lake has 3 campgrounds; one run by the State of Kansas and the other two run by the COE. I really like a COE lake campground. They are usually always in good working order and tidy. With our Senior Pass, it is 1/2 price. The full price is reasonable. We paid $8 a night for an electric site. Water and dump were in the park. It was a quiet park with crappy fishermen and a few day users having Spring Group Picnics. There was no Verizon Cell service nor any Wi-Fi. We spent one morning in the Library and another afternoon in the local Coffee Shop using Free Wi-Fi. Everyone we met were so polite ad helpful. We parked at Card Creek, which is a spot where the Elk River feeds into the lake. My daddy use to fish the Elk River near Chetopa. I love this area of Kansas. It was my childhood stomping grounds.